After a very relaxing surface interval and picnic with a view of the Alps, we decided to make our way to the Samerangersee (Lake Sameranger). After not even a five minute drive through a bit of forest we reached Lake Sameranger and parked our cars. Again, a little wooden hut made it possible for divers to comfortably change even when it was raining. 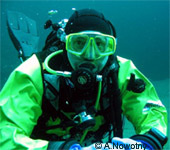 Scuba diving in the lake, the so-called "Pearl of Tyrol", is strictly reglemented, as only six divers are allowed in at any time. Therefore all dives have to be registered with the hotel. As there was still some time to go until our time slot, we decided to check out the lake and its surroundings. At first glance the lake seems to be tiny, and in fact it was definitely the smallest lake I have ever been diving in. But even from the shore it was obvious how great the visibility in Lake Sameranger is. The water close to the shore seemed crystal clear and promised us a really extraordinary dive. We returned to our cars and slowly kitted up. As the parking spot was quite muddy from the recent rain I decided to try out the hut and found that this changing place is really a great service provided by the hotel! ... into a nearly crystal clear underwater world! Visibility was really outstanding, about one hundred percent better even than at Lake Fernstein. My estimate was that visibility exceeded 30m! 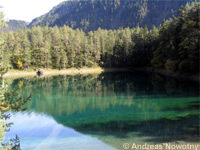 As in Lake Fernstein, the scarceness of nutrition in the water defines the underwater world: the bottom is meagre and silty, with only very little plant growth and lots of slimy algae. The only kind of fish which can be seen is a stunted version of trout. After about 25m the bottom of the lake dropped fairly steeply from about 6m to 20m. From the beginning of the drop-off it was already possible to see the underwater logs and trees at the other side of the lake. As in the Blindsee, the sunken trees are one of Lake Sameranger's main attractions (apart from the great visibility which beats that in the Blindsee by a huge margin). 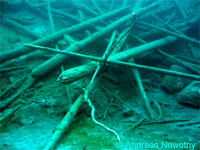 The trees can be found lying over and under each other along the underwater bank slope like a giant version of Jackstraws and offer manifold photo opportunities for the underwater photographer. After a while we turned round to start our way back. Our time slot wasn't infinite and at about 6 degrees Celsius, our semi-dry diver wasn't really getting any warmer, either. Once again we enjoyed "flying" through the clear water of the lake. The last time I experienced similar visibility was during my cenote dive in Mexico (in fact the visibility there was about twice as good again as here). I especially appreciated the fact that the visibility was still so good in the afternoon, although several teams had been in the water before us. It has to be said that both Lake Sameranger and Lake Fernstein are not suitable for beginners who have problems with buoyancy. Those who don't have excellent buoyancy control shouldn't be diving here, as they will ruin the visibility for themselves and all others. Seen from this angle, the strict reglementation of diving (only hotel guests) and especially the restrictions for Lake Sameranger are not only understandable, but also appropriate! Summing up the day, I have to say that both lakes are well worth a visit, but that in Lake Sameranger in particular a dive is a very special scuba highlight, which cold water aficionados should put high up their list of places to go! Although the Taucher.net meetings are mainly about diving, it is at least as important to sit together and chat in real life with people one knows mainly from the virtual chat on Taucher.net. Meeting new people, and so putting faces to nicknames, and seeing old friends from earlier Taucher.net meetings is what everybody looks forward to most. We therefore met in the bar before dinner to have a drink and conversation filled with scuba anecdotes. Like at most other meetings, dinner was a culinary feast! Starting with a salad buffet, followed by a fish buffet, soup, a yummy main dish and finally delicious desserts, we could definitely not complain of leaving the table hungry. For me, dinner marked the end of this meeting, as I had to drive home again. All in all, it was a fantastic day with great lakes and lots of fun getting together with friends from the internet!